A collection of tools that helps any texture artist with UV and texture related tasks. The main philosophy is to shorten typical steps into simple context sensitive single clicks. You don't need administrative rights, just drag the MZP file into the viewport and let it install itself into your 3dsMax user folders. Most scripts are developed by me, I asked some people however to share their scripts and let me include them.Note that the scripts are free to improve, change, use for your own, just include the credits should you repackage anything. I stored each tool into a self contagious *.ms file so it should be easy to explore and extend the scripts for your own needs. Installation: Just drag the MZP file into the viewport and install it from there. All files will be stored in your local 3dsmax userfiles so you don't need any Administrative rights to install it. The installation will create a folder within the 'scripts' folder called 'TexTools' in which it will copy all the TexTools files that are needed. Four icon files will be copied into 'UI\usericons' for the macroscripts. Should the installation fail for some reason a prompt window will show up with a instruction on how to copy the files manually to get TexTools running. Submitted by Scampbell on Tue, 2016-01-12 13:19. Been using your script for a while, love it. I did notice that the Pixel Unit Transform Floater has disappeared all of the sudden. Im not exactly sure why. Everything else still works perfect. only thing that has changed was a new monitor with bigger res, but didn't think that would really kill that. I should note, that when i hit the edit UV button it shows for a second then disappears right away. EDIT: after messing with it a little more it does look like an effect from resolution when i shrink the window and save current settings it shows back up. Submitted by Profound semantics on Thu, 2015-08-20 04:54. Submitted by sean00 on Fri, 2015-06-19 08:02. 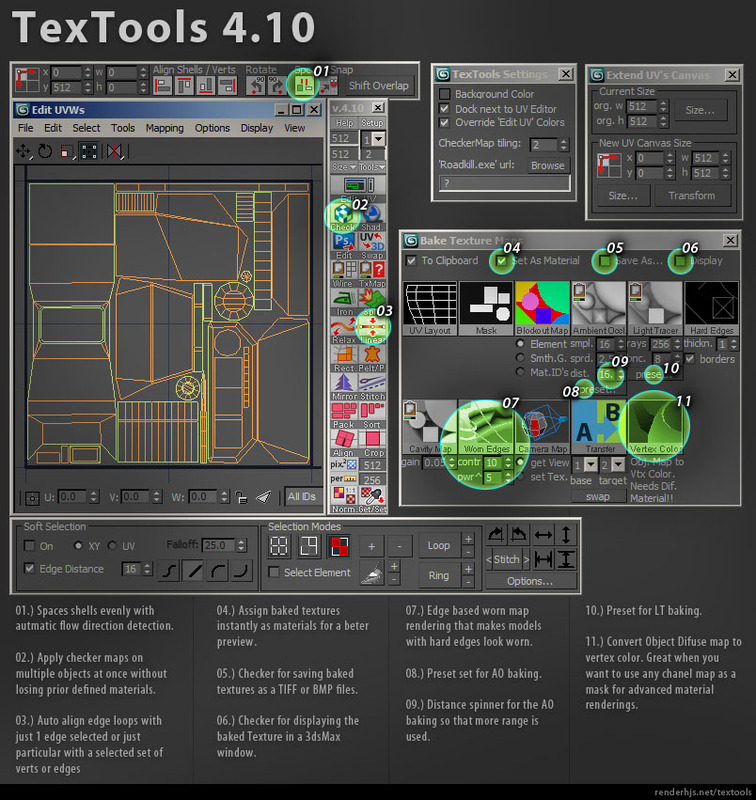 When using TexTools you will see a Toolbox inside the GUI of 3dsmax. 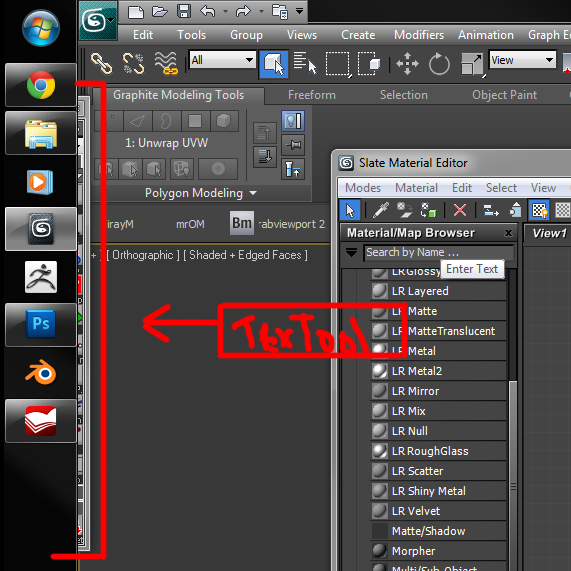 Most functions only work if you are in the editUVW mode in 3dsmax. Submitted by Pixeldamage on Wed, 2015-04-15 12:34. Submitted by asymptote on Fri, 2013-12-06 03:52. The chequered map is squished in the viewport when using 2:1 ratio textures, is there a way of preventing this ? I tried resizing the map but it still views as a 1:1 ratio in the viewports. Submitted by mastrein on Sun, 2013-07-28 04:27. Sorry commented on the wrong tool! Submitted by mastrein on Sun, 2013-07-28 04:24. Hi! I have some problems with the tool. When using max own render to texture feature I get a good normal map but when I use your tool for it, my renders comes out flat. Even though everything is setup correctly and in the same manner as when using max's own tool. Submitted by bugmenot on Sat, 2013-07-06 21:53. The issue is not with the program but on how you set Windows TaskBar, move it down and problem solved. Consider that most people have Windows TaskBar on the bottom, not left. Submitted by nhatkenhpvn on Sat, 2013-05-04 10:08. Submitted by vitalquaD on Thu, 2013-03-07 01:03. Great tool, though it has one issue. The panel appear on the left corner of a screen, outside 3ds max and I can't move it.